Generating things with code (1 of 2) – Youpi ! this article was initially published on Medium, I’m posting it here for the record. The coding platform, the language, the tools & tool-chain, the capture devices & data sources are irrelevant. This will obviously have an impact on the final result if chosen poorly but it is of no importance when designing a generative system. 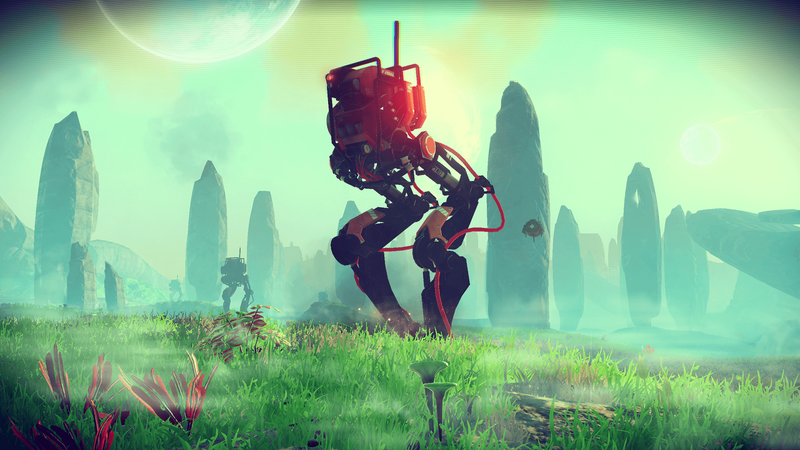 Generating things with code is language & platform agnostic. On the other hand, there are 3 important things to take into account when generating something with code: the data you’ll be using, the space in which they’ll be displayed and the process that will transform the data. Kate Compton has written an extensive post about PCG, you’ll find lots of practical advices from a seasoned professional. 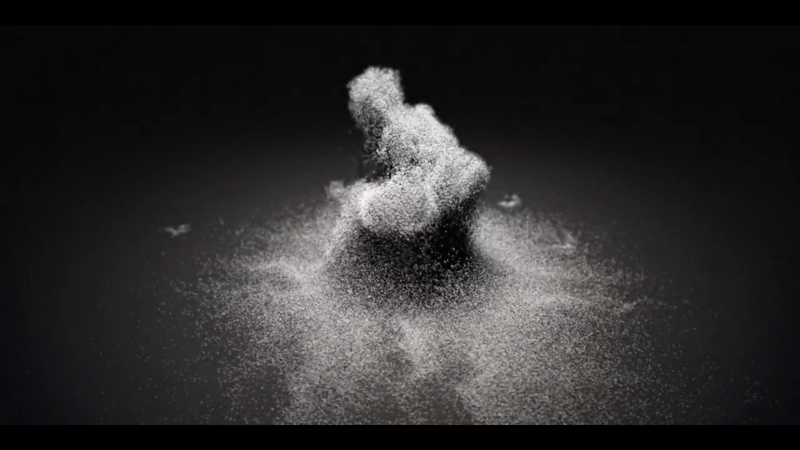 The particles move & disappear procedurally, we know the initial position and the simulation will determine where the particle ends. 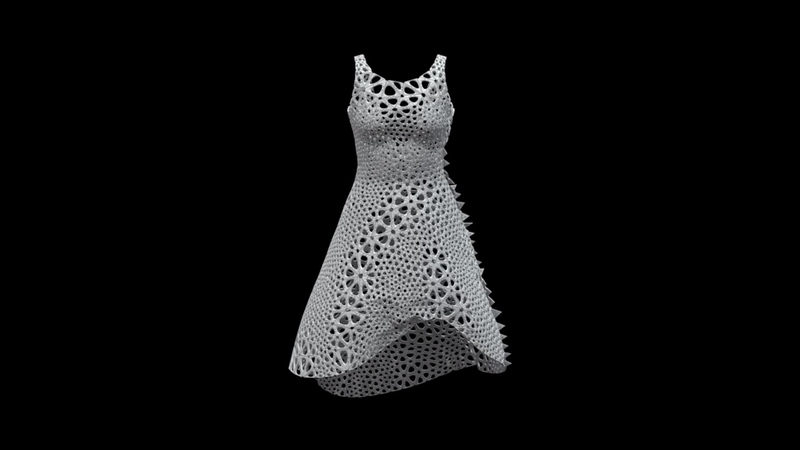 This generative system can work with any 4 dimensional data set (3D position over time). The universe is a continuous system yet computers need to process discretedata. In a nutshell, the difference is that continuous data are measured while discrete data are counted. The reason for that is simple ; the precision of the data that a computer works with are limited. For instance, the continuous time must become an interval for us to use it in a generative system. The light must become a color palette, a chemical reaction must be described as a process, a phenomenon will have to become a simulation etc. Any given object can be described by a number of dimensions, in code we often refer to these dimensions as properties or fields but that’s somewhat restrictive. 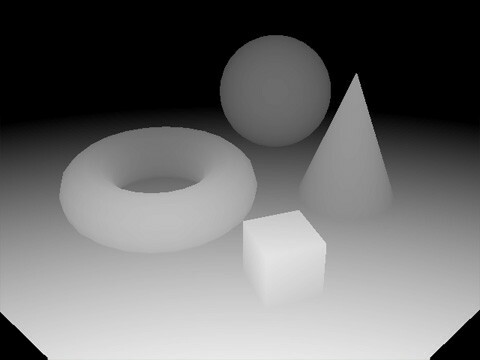 The values of each dimension of an object can vary without affecting the others. In the case of light, the direction, speed, wavelength and energy can vary independently ; they’re all distinct dimensions of the light and we can model and simulate them in code as the properties of an object. acknowledged that in the computers’s memory, a number or a character is stored as an array of bits, we could argue that a number or a character are themselves N-dimensional objects. the object is already multi dimensional ; each dimension can be altered without affecting the whole. The string can be longer or shorter without altering the letters, and the letters can change without altering the length of the sentence, the image’s width can change without altering its height, a.s.o. From the dimensions’ perspective, a single tweet can potentially be represented in ~72 dimensions, often themselves N-dimensional. The underlying idea is that we often overlook the complexity of the simplest things ; a short text, a limited set of colors, an IP address are complex N-dimensional objects. TYPE_ACCELEROMETER Motion detection (shake, tilt, etc.). TYPE_AMBIENT_TEMPERATURE Monitoring air temperatures. TYPE_GRAVITY Motion detection (shake, tilt, etc.). 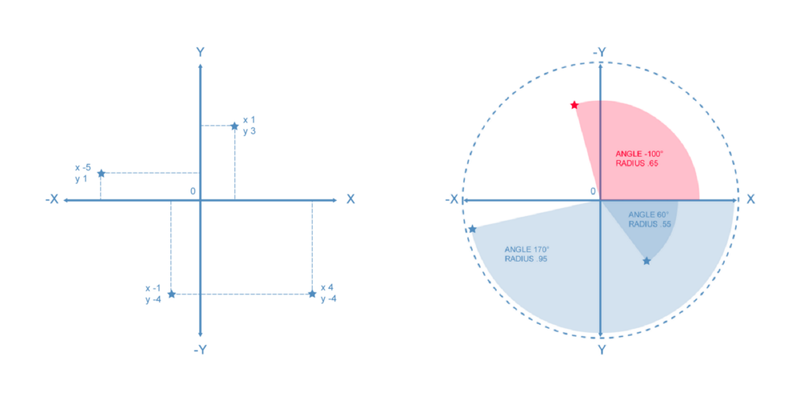 TYPE_GYROSCOPE Rotation detection (spin, turn, etc.). TYPE_LIGHT Controlling screen brightness. TYPE_LINEAR_ACCELERATION Monitoring acceleration along an axis. TYPE_MAGNETIC_FIELD Creating a compass. TYPE_ORIENTATION Determining device position. TYPE_PRESSURE Monitoring air pressure changes. TYPE_PROXIMITY Phone position during a call. TYPE_RELATIVE_HUMIDITY Monitoring absolute &amp; relative humidity. TYPE_ACCELEROMETER Motion detection (shake, tilt, etc.). TYPE_GRAVITY Motion detection (shake, tilt, etc.). TYPE_GYROSCOPE Rotation detection (spin, turn, etc.). TYPE_LINEAR_ACCELERATION Monitoring acceleration along an axis. TYPE_PRESSURE Monitoring air pressure changes. TYPE_PROXIMITY Phone position during a call. TYPE_RELATIVE_HUMIDITY Monitoring absolute &amp; relative humidity. All these sensors (and more) are readily accessible and can be recorded from the smartphones as an input to our generative system. The open data available to us have grown exponentially for the past years, they are rather oriented towards statistical analysis, mostly “geo-social” and often geolocated. This is especially true for cartography but not only. We can also use some tracking devices such as a webcam or a microphone as with a smartphone but also mainstream devices like a Kinect (video, depth, 3D point clouds, infrared video, skeletal information), the Leap Motion that precisely scans a smaller area and returns a well defined point cloud and descriptors for hands and fingers positions. More recently the VR devices like the Oculus Rift (mostly 3 DOF) and the HTC Vive (room scale 6 DOF) that allow to precisely capture the orientation and position of a headset and hand held devices in space and time. In short, there are more and more data available and they become more and more complex. Reduced to sets of uni-dimensional variables, these data can shift between various spaces. Spaces are fields of representation, a place where the data can exist. They have specific qualities that can help you highlight the traits of the data you’re using. The important thing to acknowledge is their umber of dimensions ; N-dimensional data require N-dimensional space to be fully displayed. 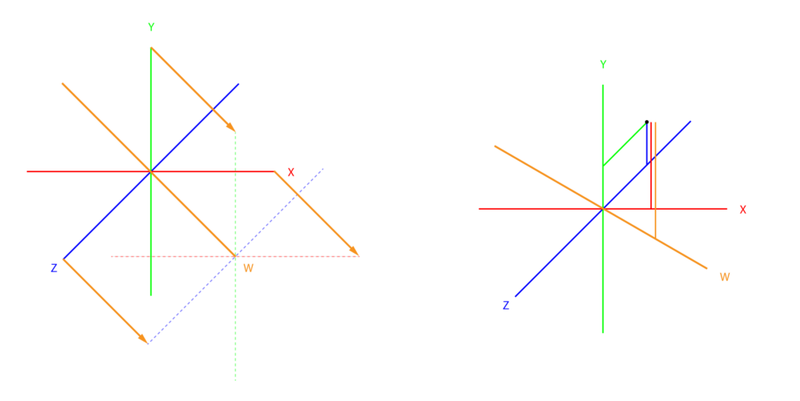 The 2D cartesian space (above left) will let you display 2D data in a simple manner based on their X and Y values. It’s the space of a page, a print or a map there is few to no work to get the data to fit and it’s easy to draw lines between data points. The polar space (above right) is a way to represent 2D data as an Angle/Radius pairs, displaying data in the 2D cartesian plane requires a simple transform ( x=sin(A)*R & y=cos(A)*R ), once transformed, you can draw lines and most graphic APIs have methods to draw arcs between data points. Extending the 2D cartesian (X/Y) space to 3D is trivial, first our object needs a third dimension (Z), then we need a third dimension in space to display it. It’s the most used 3D space, it’s very intuitive to use and to understand. But there are some lesser known 3D spaces. A good example of the above mentioned shift is the colors spaces. A color is usually stored as a triplet of values: Red, Green and Blue ranging from 0 to 0xFF to match the way they are used by graphic APIS (color = R<<16|G<<8|B). As they have the same number of dimensions as a 3D point, we can map these data points directly to a 3D cartesian space where X=R, Y=G and Z=B and as we saw above, they can also be mapped to cylindrical and spherical spaces (HSL colors). That’s a very important feature when working with generative systems ; it’s a sort of synesthesia where colors can become positions, positions can become sounds, sounds can become colors a.s.o. 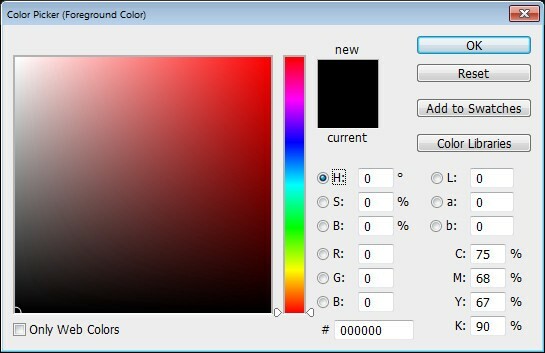 Colors are a good example because they have a low number of dimensions, there is at most 4: RGB + Alpha (opacity). 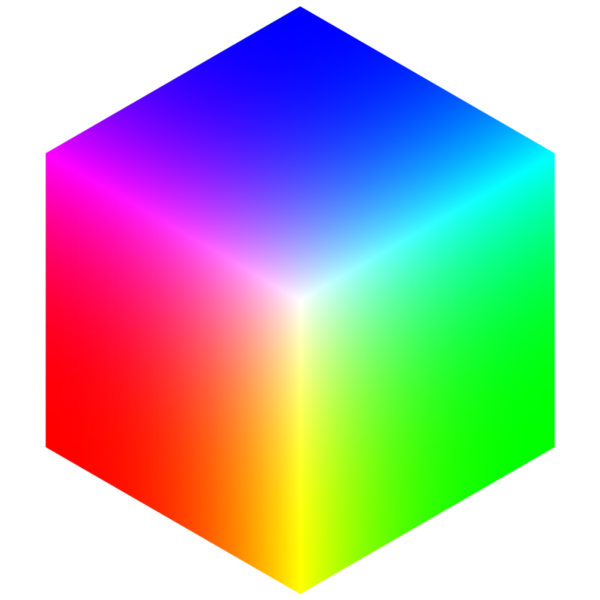 Now what if we wanted to represent the 4th dimension of a color set? 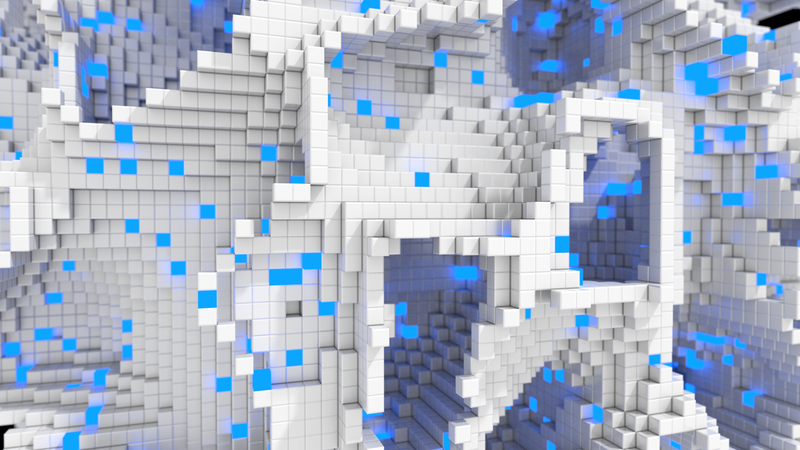 We know how to display our colors in a 3D space but what does a 4D space look like? The above illustrates what a 4D space could look like, the 4th dimension (usually, the time) would be represented by the orange axis. To represent high dimensional space data, we’ll often need to project them onto a lower dimension. This operation will obliterate the values of some dimensions, and we will have to find a way to represent the parameters that “went missing” during the projection. 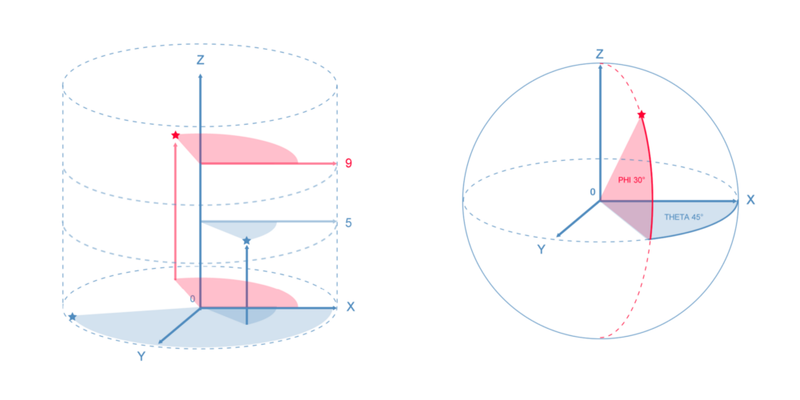 In the above illustration, it is very difficult to locate the points drawn on the right in the 4D space as not one but 2 dimensions went missing during the projection. This color palette is the 2D projection of a 3D object and the spectrum ramp represents the dimension that “went missing”. and a depth buffer is used to represent the “missing data” as a greyscale: the brightest the pixel, the closest our data point was to the camera. depending on the space your using, there are some strategies to reduce the dimensionality of your dataset. 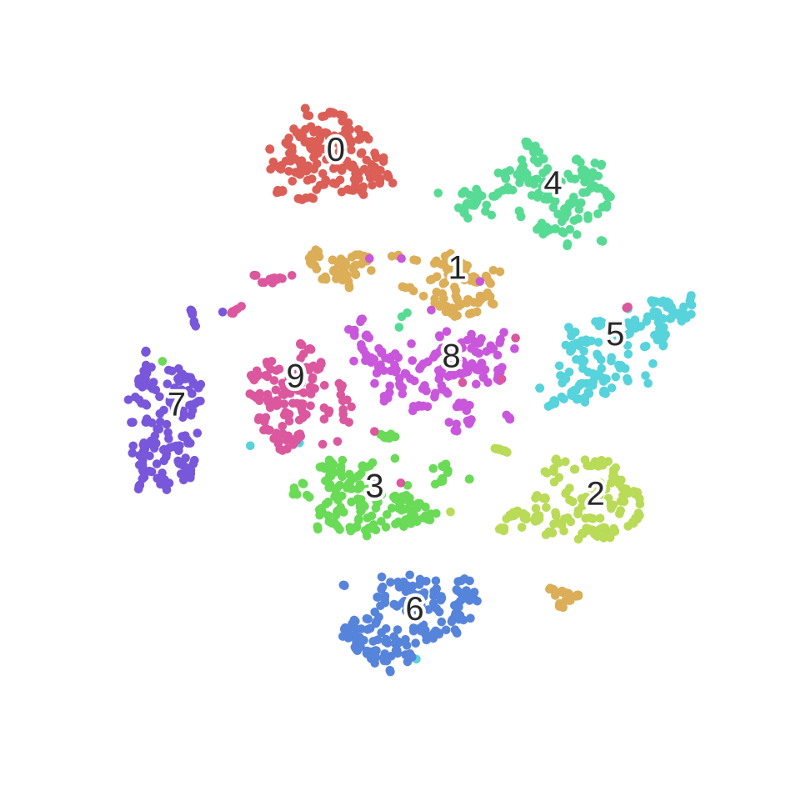 The above picture is the result of the t-SNE algorithm applied to the MNIST dataset ; high dimensional feature vectors are grouped by similarity then projected in 2D. In general, making sense of high dimensional data is hard (or lossy) and you should keep the dimensions’ count as low as possible. As a final note, there exist many other types of spaces. If we think of geometry only, the non-euclidean spaces and hyperbolic spaces are very interesting to explore (and not too hard to implement). There is of course the physical/tangible space, you’ll probably need some extra hardware like a laser cutter, a 3D printer or a CNC milling machine but holding the results of your generative system in your hands is very rewarding. Also worth noting the sound which usually requires a physical space to be explored but generates a space in space.